So the Guys did it again!! Congrats!! You guys are awesome! I have to brag about my cute hubby, he hit a grand slam in the Championship game, which helped them to pull ahead and win!! 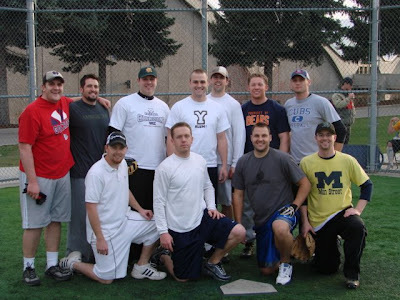 Team members, left to right, back row: Brett Peterson, Tyson Dobbs, Jon Summerhays, Bryce Mackay, Nick Lemon, Shay Wells, Levi Adams; front row: Taylor North, Beau Jaussi, Nathan Anderson and Gage Arnold. Click the link to get the story! Audrey with her new favorite toy... mom's cell phone! Well actually any ones cell phone! Well we knew when we had girls that it would eventually come to this, but we just didn't realize it would be this soon. So here's to having girls!!! We sure do love them and wouldn't trade them for anything! I put a mirror (eye level for Abby) up in Abby's room... and now this is all she does!! So I must say thank you to all those who gave her makeup for her birthday and Christmas!! It is sooo much fun and sooo messy! But hey it keeps her busy and she loves it. What more could you ask for! 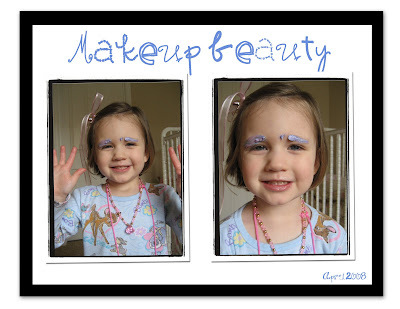 I think she might have a future in makeup design...what do you think? Happy Birthday to our little Audrey! 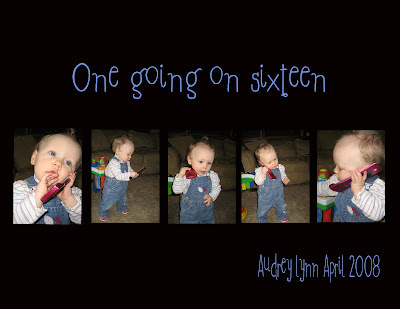 Audrey turned 1 on April 1st 2008. She loved being the center of attention, and having her very own CAKE!! 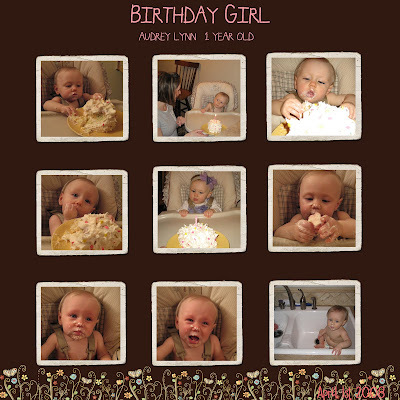 She was so cute and curious of her cake and ice cream....until the ice cream fell on her tummy! Burr cold! Then as you can see from the pics, she was done. So we hosed her down in the kitchen sink and let her play with all the friends!! Thanks so much for all the cute presents! climbs up and down stairs like a pro! finally has enough hair for small piggy tails!! Over all she is the sweetest little girlie anyone could ask for! We love her so much and are so glad that she is part of our family!! We are a penny RICHER!! To those that love Pizza Hut Pizza don't read!! So the other day Levi was feeling like pizza, which is always great for me, because then I don't have to cook! So we ordered our pizza and Levi went to pick it up. When he brought it in it smelled so GOOD!! We dug in, there was some serious scarfing going on.... until Levi stopped dead in his tracks!! I looked at him and he had a blank stare! 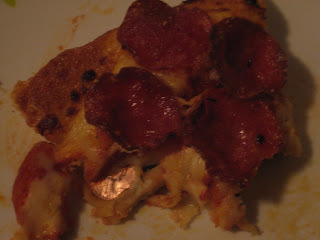 Then he showed me his pizza.... there was a freaking PENNY cooked into the crust!! Needless to say we lost our appetite and called immediately to complain. Well we didn't get much, but they did refunded our money and gave us a credit of $35.00. I guess it is better then nothing!! And we got a good laugh out of it!! So if your ordering pizza any time soon, beware of PENNIES!! Sorry the picture is pretty gross. 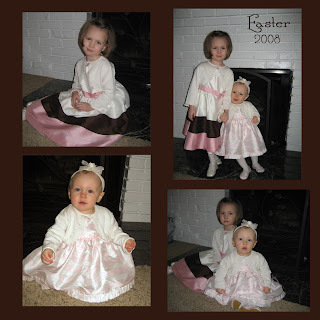 Finally.... here are our CUTE girls in their Easter Dresses! We started Audrey on her antibiotic and she was better in 4 days!! I really wish that the Dr. would have listened to a mothers intuition...it could have saved us a lot of sleepless nights and an unhappy baby, not to mention missing out on Easter Sunday. Oh well life goes on. Well this last week has been really busy! We found a cute new condo about a month ago and moved on the 29th. It is a lot nicer than our old place and quite a bit bigger, not to mention cheaper! It also has a lot of the amenities that we have been missing, like a gas furnace, central air, a garbage disposal, tile in the kitchen and dining room, a really nice deep tub!, bigger bedrooms, a lot of natural light, a bigger kitchen with all stainless steel appliances, the fridge even has an ice maker and water on the door!! It is three stories, the bedrooms are upstairs (2), then the kitchen and family room are on the main floor with a small bathroom, the basement is not completely finished but it works great for an office, laundry room and storage. It also has a cute fenced patio. We were able to get everything moved on Saturday and are pretty much settled now. It feels good to know that we will be staying here for the next two years, except for summers of course, but we wont be moving all our stuff home for the summers. Well there are quite a few pictures that need to be posted, ( Easter dresses, Audrey's birthday, new house pic's etc.) but you will have to wait. We are waiting on comcast to come and put a line in for the Internet so that we can use our desk top in the basement! They should be here SOON, so keep checking back because there are some great pics! !